Note: at some point the graphics on the Financial Post site dissappeared. 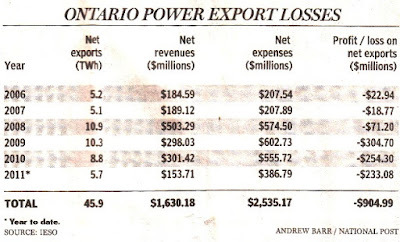 McGuinty and Canwea and all "his" ENGO's and Green Industry Gang" are nothing more than "parasites sucking the host's $$$ supply called tax dollars out of their pockets". To take a Energy System which has served us well for over a 100 years and was the envy of the World and in a few short years, bring it down to a third world status with fake promises of Green and Clean Energy" is nothing more than a giant "con game" which destroys homes, health, lands and lives for decades. The words "criminal acts" are not strong enough!